Blossburg: William Bauchop Wilson: Arnot, PA.
where W.B. Wilson worked as a young miner. Bloss township, where Arnot is located, was taken from Covington township and named in honor of Aaron Bloss the founder of Blossburg. Its organization as a township took place in June of 1841. It originally encompassed the area which would eventually become Blossburg borough in August 1871, and a large portion of what would become Hamilton township in December 1871. In Bloss township in 1841 there were three different veins of coal underlying almost the entire township. The coal was of a semi-bituminous nature and the three veins became known as the Seymour, Bloss and Bear Run. The Bloss vein was the one that would be mined at Arnot. Large deposits of coal were found along Johnson Creek, about four miles southwest of Blossburg. 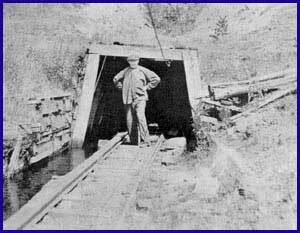 In order to develop the new coal field, the Blossburg Coal Mining and Railroad Company was formed and incorporated April 11, 1866. Members of the Corporation were Constant Cook, John Arnot, Charles Cook, Henry Sherwood, Franklin N. Drake, Ferral C. Dininy, Henry H.Cook and Lorenzo Webber. The corporation proceeded to purchase nearly the entire area of Bloss township and preparations were made for mining and marketing the coal. A wagon road was built from Williamson Road to the coal openings two miles away to supply the site of a new village that was to be built. The new village was to be named Draketown, in honor of Franklin N. Drake the President of the coal company. In the summer of 1866 a railroad was completed between Blossburg and Draketown, as the No. 1 Drift was being opened. Later would come Drifts Nos. 2, 3, 4 and 5. A sawmill was erected at the location and Nicholas Schultz arriving in 1867 was placed in charge as head sawyer. At this time dwellings were built as well as a store. A year later a post office was built and the name was changed from Draketown to Arnot, in honor of John Arnot one of the incorporators of the company. Arnot grew rapidly in population and was soon the largest town in Tioga county. By 1883 Arnot was at its peak in population with between 3,500 and 4,000 residents. Schools and churches were built and lodges and societies organized. After the coal strike of 1899 things were not the same in Arnot. As in all industry, methods change, this was no exception in Arnot. The days of the drift miner were numbered as the cost of mining the coal was ever increasing. After the national coal strike of 1922 drift mining in Arnot gradually came to an end. The coal company decided to sell Arnot to the residents of the town in 1952, for a price of $45,000. The amount of land conveyed was 562 acres, with a lot and house going for $500. Money received from the sale of any of the unused acreage is used to benefit the community. There is no longer any heavy industry in Arnot and many of the residents travel to jobs in other areas of Tioga and Lycoming counties. According to figures from the 1995 census there are 390 residents of Bloss township. Today as you ride through Arnot the one thing that you can't miss are all the new homes being built. Surely with the completion of Route 15 from a two lane highway to a limited access four lane through Tioga county the population of Arnot will increase.